With apologies to a certain songwriter, it’s easy to be Green if you want to market to sustainably leaning homeowners. You just need to speak their language. In our example, we’re going to focus on the couple that would like to build a sustainable home. They are in their 50s and are in no rush to build. They’re not motivated exclusively by price and current style preferences for stainless steel appliances and granite countertops. Our particular couple is planning this home for their retirement, which will have features suitable such as “aging in place.” Translation? Our couple wants to stay in their home for as long as possible, which means a single-level ranch style home with wide doorways to allow wheelchair access when that time comes. Same goes for bathrooms. The kitchen will be able to morph into lower counter levels, and deeper counters to allow for wheelchair access. Other areas including the lower level or basement, that might not be used regularly, would have separate heating systems that can be set back or turned off. The photo is of a Potterhill home constructed in Greenhills, Ohio. It’s a rare single-story LEED home, normally a two-story home is more sustainable to heat and cool. Here’s a link to a similar home on Potterhill Home’s site. There is no one way to build a green home. The U.S. Green Building Council’s Leadership in Energy and Environmental Design (LEED) certification system aknowledges that by encouraging a wide selection of sustainable features. Based on a 100 point system, only 40 are needed for Certification. 80 points achieves Platinum level. The LEED scale is weighted according to equivalent measurable environmental benefits for five categories: sustainable sites, water efficiency, energy and atmosphere, material resources and indoor environment. Although you might earn a point for a two story home, that point is no different than a point for bicycle storage. It’s the mixing and matching points to the goals and purpose of the project that makes the LEED system so versatile. Schools, for example focus on energy efficiency, daylighting and indoor air quality instead of the lack of points incured by using brick for the exterior. This sustainable couple will have some different preferences than Mark’s list but others will be just as important. Cost is the largest difference between sustainable design and what you will see walking through Home Depot or Lowe’s. Price is always important, but for Green Building projects that means taking into account the cost to the environment. Reusing an existing building, low water use flush and flow fixtures, not having large expanses of turf grass, high levels of insulation and sealing to spend less on HVAC, using salvaged materials and worrying just as much about the Volatile Organic Compound content of paint as well as the color are some of the different environmental concerns of green buildings. Instead of new, latest, designer and high end; their Green Building Consultant will educate them about the definition of recycled, regional and rapidly renewable materials. Their beauty and style will come from very high quality salvaged doors, cabinets, fixtures and floor treatments. One of the most important first stages in a new green building project is the treasure hunt for materials. 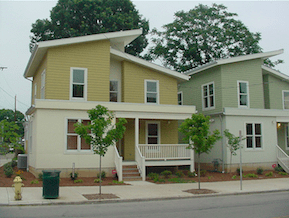 The photo is of two of the first LEED homes in Cincinnati, at Chase and Fergus Sts. in Northside. Here’s a link to the developer Cincinnati Northside Community Urban Redevelopment Corp. website. Proper installation is also very similar and different for a sustainable home. 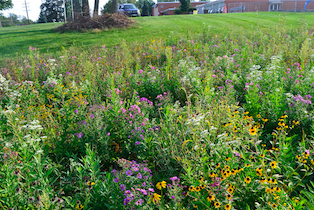 Planning for a native wildflower and grasses yard is a three-year process. To many tradesmen a 1.6 gallon per flush toilet is a low-flush fixture. The USGBC LEED standards requires 1.28 gallons per flush to meet the minimum standards for a green home. The number one heating and cooling goal is to use as little heating and cooling as possible. Unfortunately, the HVAC industry sells heating and cooling systems, not passive heating and cooling design, air sealing and insulation. The photo is from Solomon Gamboa’s blog, which inspired us to use his services to start planting a sustainable landscape last year. 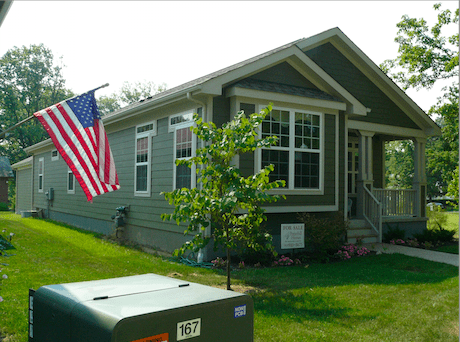 For the “Who has used it?” question our new home owners will have to look to green homes built in their neighborhood. Luckily that is easy to do by going to the USGBC directory online. They’ll find that LEED homeowners are a friendly bunch and enjoy sharing their sustainable home journey with others on their home blogs and tours. Here’s a great blog by architect/owner Krista Nutter, their energy bill for the first year was $200. “Where do I buy it,” is getting to be a less difficult part of Green Building Marketing. There are many exacting requirements that need to be met before purchasing, and this has to be done before the sale. Green standards and requirements are well known and the manufacturer’s have the documentation at the ready, but you have to ask for it up front to avoid purchasing the wrong materials. For example if your building material supplier delivered exterior grade plywood, which typically uses urea-formaldehyde binder, to your site and you used it for subflooring, your home would be disqualified for LEED certification. “Why,” is also entirely different for environmentally minded homeowners. Single-family detached homes are more difficult to heat and cool. Urban sites are closer to utilities and public transportation. Most potential homeowners wouldn’t even think about being water independent, but the Metropolitian Sewer District’s sewage treatment plants pump raw sewage into the Ohio River during severe rain storms. Likewise, energy independence is possible with smaller home footprints, the antithesis to a large home on a large lot “Heritage Class” description by “market” homebuilder companies. Sustainable homeowners are much happier with an improved older home, reused high-quality antique materials rather than that “new carpet smell” which is carcinogenic. The photo is of the Kinsman Residence, Cincinnati’s net-zero energy use home at 650 Glen Parker in Northside. Building Owner – The sustainable performance of your product or system. 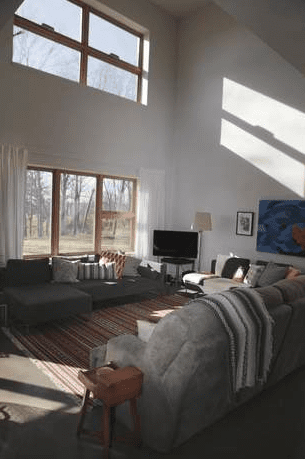 Architect – The architect should live in a home built to the sustainable standard you are thinking about whether Energy Star, LEED, Passive House or Living Building Challenge. And their home should have been economical in materials and construction. The photo is of Architect Andrew Keller‘s residence in Cincinnati. The Keller-Kimbrew home is one of the few architect/owner LEED homes in the region. Andrew designed his own home in the international style, but he’s just as at home in traditional styles. Stephanie Labbe is another architect/owner LEED home example in Montgomery, OH, her blog is a great diary of building a green home. General Contractor – Likewise with the designer, if they don’t talk the talk and walk the walk they won’t know how to do it for your project either. Contractors – Contractors can ruin the best designed and constructed project with a careless substitution or construction practice. Careful vigilance by the owner and the general contractor is required. This is essential to limit labor costs. It would be better if they didn’t practice on your home. Distributors – Profit margin may be the language they use, but it won’t help your Green Building project. It is harder to distribute sustainable building materials because of the training involved. Homebuyers – Mark’s comment, “Lifestyle is the most important word in the language of the new homebuyer. You hear words like “location” and “resale,” but the main word is “lifestyle.”” couldn’t be truer, it’s just that “lifestyle” means different things to different people. For sustainable homebuyers, it’s the knowledge they have of the environment and how they have decided to live their life. Homeowners – Likewise, Mark’s definition of this buyer persona, “Durability is the big word in the language of home improvement and repair. Even when homeowners talk about aesthetics, they don’t want something that will go out of style quickly. If they are replacing a roof, the most important thing to them is that they won’t have to do it again.” is right on except including “style.” Sustainable aesthetics and style are very different from what you will find at Walmart. Sustainable solutions are always more durable. Also save the date for the local Chapter of the U.S. Green Building Council’s Green Home Summit Friday and Saturday August 22 & 23 at the LEED Certified Sharonville Convention Center. 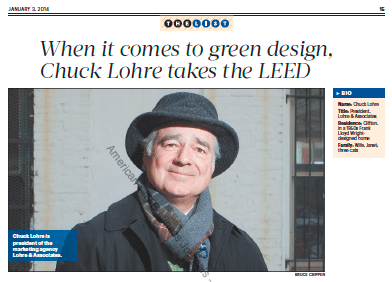 For a no obligation green building consultation for your home or office please contact Chuck Lohre, LEED AP ID+C. He’ll go over the U.S. Green Building Council Leadership in Energy and Environmental Design Reference Guide with you and offer helpful suggestions for Green Building Consultants, Architects, Interior Designers, Building Material Suppliers and Contractors. You can even borrow the Reference Guide if you like. Article from the Cincinnati Business Courier.